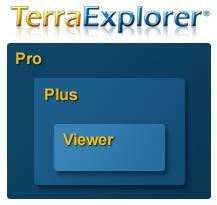 All the products in the TerraExplorer family are built utilizing the same technology. Users can navigate through high resolution 3D world environments created by fusing aerial and satellite photography, terrain elevation data and other 2D and 3D information layers. Basic editing capabilities are available as well as advanced terrain analysis tools. When embedded in a SkylineGlobe web package, the standard TerraExplorer Viewer serves as a SkylineGlobe viewer, providing advanced API capabilities. Adds feature and raster layer importing, advanced editing, basic catalog functionality and the advanced Pro API interfaces. Adds publishing capability, feature layer editing and querying, advanced objects and drawing tools, as well as a set of tools for professional usage.